Caritas migrant worker research report launched: Stand up for what’s right – supporting migrant workers. 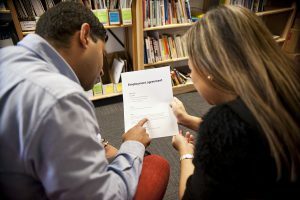 Churches and communities can help reduce migrant workers’ vulnerability to exploitation, by welcoming and supporting them to seek assistance from relevant agencies. Caritas Aotearoa New Zealand Advocacy and Research Analyst Cathy Bi, explained this to participants at a seminar on migrant worker experiences held in Wellington last month. Hosted in Wellington by The Catholic Institute and Caritas on September 8, the seminar launched a report on research conducted this year by Caritas on unfair treatment of migrant workers in the Wellington Archdiocese area. Stand up for what’s right – supporting migrant workers draws on interviews with migrant workers and the people who have supported them, to help the Church community understand migrant workers’ experiences, barriers preventing people asking for help, and what parishes and Catholic communities can do to support them. Author Ms Bi said migrant workers who are being exploited face not only language barriers, but also an unfamiliar legal system and the stress of confronting an employer over ill-treatment. ‘There is a gap for vulnerable migrant workers in accessing justice and we can’t necessarily expect them to do this alone,’ Ms Bi says. At the launch, Palmerston North Diocese Pastoral Services Manager, Mark Richards, asked who in our parishes would advocate for people. He said the first step always required getting to know people and their situations. Dennis Maga of the Union Network of Migrants said migrant workers have few choices about taking work with poor conditions. ‘Kiwis are not lazy, they just have choices. The dirty, dangerous and difficult jobs are being done by migrants,’ he said.